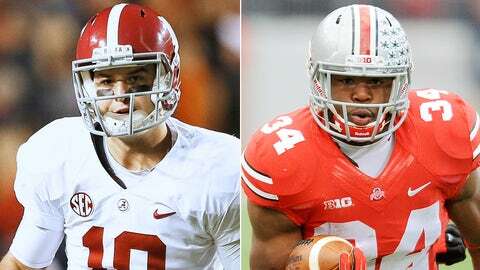 AJ McCarron and Carlos Hyde won't be in Pasadena, but they will be part of the final BCS party. It’s time for the bowls. But first, let’s say goodbye to the BCS. While we often castigated and ridiculed the BCS, the end results were almost uniformly positive. Aside from Auburn in 2004, there are very few teams with legitimate gripes about being left behind by the system. It was far from perfect, but the BCS was a necessary middle ground en route to a playoff. I’m glad to see the BCS go, but I will miss the idea that the best teams in college football can be reduced to quartiles based on computer rankings. Now let’s take a quick look at the BCS bowls by ranking the 10 participating teams on the most reliable measurement tool on earth — the Clay Travis eye test. With four BCS top 25 wins, two of which were in the top 10, there’s no doubt that Auburn has the most impressive resume of any team in the top 25. The Tigers opened as a full touchdown underdog against Florida State. Now we have a month to debate whether FSU can stop Gus Malzahn’s rush attack. According to Vegas, the Crimson Tide would be favored against every team in college football. But on that special Saturday on the Plains, Auburn pulled off the memorable upset. Now, the best the Tide can do is put a whipping on Oklahoma in the Sugar Bowl. Even still — is there any doubt that Alabama wins seven out of 10 games against Auburn, even in Jordan-Hare? The Seminoles are good, but they play in the fifth-best conference in America and have only one top 25 BCS win this season, which was over Clemson — a team that hasn’t proven itself to be worthy of that ranking. Until you play someone of consequence, this is as high as I can have you ranked. Baylor would be my final team to suggest for the playoff if I was on this year’s selection committee. My four would be: 1. Auburn 2. Alabama 3. Florida State 4. Baylor. So I’d have Auburn playing Baylor and Alabama playing Florida State in the national semifinals. Why do I pick Baylor as my fourth team? The Bears went 11-1 in the Big 12, the nation’s third-best conference, and won the conference outright. Sure, a bit of the shine is off the Bears after the road loss at Oklahoma State — but which other one-loss team has a better resume than Baylor? The only other teams I’d even consider would be Stanford and Michigan State, and I’m picking Baylor by virtue of the strength of the Big 12 as compared to the strength of the Big Ten. Stanford vs. Baylor is a tougher call, but I’m giving it to the Bears by a slim margin. The Cardinal would be my No. 5 team if I were picking playoff teams. (For playoff purposes, I’d put the Cardinal above South Carolina due to the conference title). Yes, Stanford lost to two unranked teams on the road (Utah and USC) — but the Cardinal also beat Arizona State twice, trampled Oregon, took down UCLA and were the unquestioned best team in the nation’s second-best conference. They’d be just outside the playoff. On Saturday night, we were all Spartans. Congrats to Michigan State for eliminating all BCS uncertainty with a double-digit win over Ohio State. I can’t wait to see what’s going to happen in the Rose Bowl game against Stanford. That’s going to be a war. Saturday night, Ohio State played its first AP top 10 team outside of a bowl game since 2009. The result? A double-digit loss and Urban Meyer eating cold pizza on a golf cart. The Buckeyes still don’t have an AP top 10 win against a team outside of a bowl game since 2006. I’d argue that Oregon deserves a BCS bowl bid over Oklahoma, but Sooner fans will travel better to New Orleans than Duck fans will. So, we get Alabama against Oklahoma instead of Alabama against Oregon. The Tigers owe their entire football resume to a Week 1 win over Georgia. Otherwise, Clemson hasn’t done very much impressive all season. But, you guessed it — their fans will travel for an Orange Bowl game against Ohio State. Neither of these two teams has beaten a top 20 ranked BCS opponent all year. Garnering their berth by virtue of the American Athletic Conference’s automatic bid, Central Florida has just one loss all season, at home against South Carolina. The Knights went 11-1, 8-0 against the rest of the conference, including an impressive road win over Louisville that knocked the Cardinals out of the national conversation. South Carolina: While the Gamecocks deserve a BCS bowl bid, each conference is limited to just two selections. Missouri: Mizzou is left out for the same reason as South Carolina; the Tigers would probably be the SEC’s fourth pick overall otherwise. Oregon: Not picked because of travel distance for fans and the belief that they won’t sell as many tickets. So, there you have it. Thanks so much to you guys for reading all season long. It’s been lots of fun sharing another season with y’all. Now it’s time to get ready for Auburn-Florida State.